William Horn Battle, lawyer, legislator, and jurist, was born in Edgecombe County. His father was Joel Battle, cofounder of one of the first cotton mills in the Southeast; his mother was Mary P. Johnston. Battle entered the sophomore class of The University of North Carolina and was graduated two years later, in 1820, second in his class. He then studied law for three years at Williamsboro in the office of Chief Justice Leonard Henderson of the state supreme court. He was admitted to the bar in 1824. The following year he married Lucy Martin Plummer of Warrenton and entered upon the practice of law at Louisburg. He was an unsuccessful candidate for the lower house of the General Assembly in 1831 and 1832 but represented Franklin County in the House of Commons in the legislative sessions of 1833–34 and 1834–35. From 1834 to 1839 he served jointly with Thomas P. Devereaux as reporter to the state supreme court. Upon Devereaux's resignation in 1839, he was made sole reporter and moved his residence from Louisburg to Raleigh. In 1833, Battle was named one of a commission of three charged with the responsibility of revising the statutory laws of the state, and in 1837 he was one of two commissioners to see the revised statutes through the press. In 1839 he was a delegate to the Whig National Convention that nominated William Henry Harrison for the presidency. In 1840 he was appointed a superior court judge, and in 1843 he moved his family to Chapel Hill to educate his sons at the university. Becoming professor of law in The University of North Carolina in 1845, he served continuously in the position until 1868. In 1848 he was given an interim appointment to the state supreme court, but the legislature did not confirm him in the position. He was, however, reelected a superior court judge. In 1852 he received a permanent appointment as a justice of the North Carolina Supreme Court; he served until his removal by the Reconstruction Act of March 1867. In 1868 he moved to Raleigh to practice law in partnership with two of his sons. The General Assembly of 1871–72 appointed Battle sole commissioner to revise the North Carolina statutes, and the legislature of 1872–73 authorized the publication of the result as Battle's Revisal. For several years at this period of his life, Battle served as president of the Raleigh National Bank. His wife died in 1874, and in 1876 he returned to Chapel Hill with his son Kemp, who had been elected president of the reopened University of North Carolina. He again served as professor of law in the university until his death at Chapel Hill in 1879. Burial was in Oakwood Cemetery, Raleigh. His portrait was presented to the North Carolina Supreme Court in 1892. In addition to his work as reviser of the state's statutory law, Battle edited several of the early volumes of the North Carolina Reports and in 1865 prepared a digest of the decisions of the North Carolina Supreme Court, which he published in three volumes at his own expense. 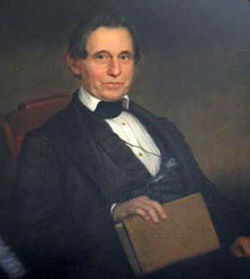 He was a charter member of the antebellum North Carolina Historical Society; prior to the Civil War he wrote for the University of North Carolina Magazine biographical sketches of early justices of the state supreme court and short articles on the early history of The University of North Carolina. Although he was reared in a Baptist family, he did not affiliate with any church until middle life, when he joined the Episcopal church, his wife's denomination. He was for many years a vestryman of the Chapel of the Cross, the Episcopal parish church of Chapel Hill, and for thirty-five consecutive years was lay delegate to the denomination's general convention. Before the Civil War he was a Whig and during Reconstruction a Conservative. Although he supported the Confederate cause once North Carolina had seceded, he considered secession unwise and deplored the Civil War. Battle was the father of ten children, two of whom, Julian and Thomas Devereaux, died in infancy. The six sons who reached adulthood were all graduates of The University of North Carolina: Joel, Junius Cullen, Wesley Lewis, Kemp Plummer, William Horn, Jr., and Richard Henry. Battle's oldest daughter, Susan Catharine, who never married, was long an invalid. His youngest daughter, Mary, married William Van Wyck II. Joseph B. Batchelor, "Address at Presentation of Portrait to Supreme Court," 90 N.C. Reports . Battle Family Papers, David Lowry Swain Papers, and Charles Phillips Papers (Southern Historical Collection, University of North Carolina, Chapel Hill). Obituaries, Funeral, and Proceedings of Bar in Memory of W. H. Battle (1879). Raleigh Observer, 15 Mar. 1879. Battle, William H. William H. Battle’s Notebook., 1800. Brown, William Garl. "Portrait, Accession #: H.1964.123.37." 1859. North Carolina Museum of History.